Die Mercurii, videlicet, 20 die Julii. Message from the H.C. about the Impeachment against the Lord Mayor. Letter from the Earl of Holland. Sir Philip Vernatti and Jennings. Bourne sent for, for Words against the Parliament. 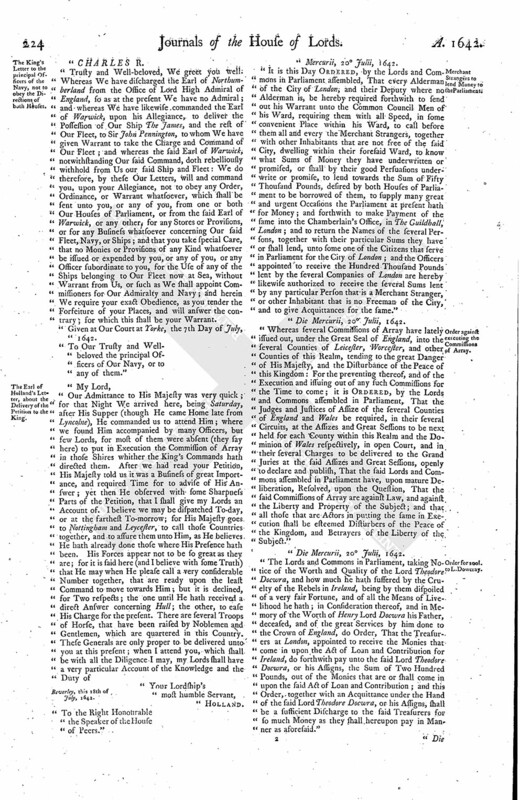 Pacquet from the Earl of Warwick, with the following Papers. Conference about Forces in Ireland reported. Message to the H. C. that the Lords are ready to give Judgement against the Nine impeached Lords who went to York. Speaker of the H. C. demands Judgement against them. Committee, who went with the Petition to the King, to return if they receive not a speedy Answer. The King's Warrant to the Naval Officers at Chatham, to supply Sir John Pennington with Stores. Sir William Russel's Letter to the E. of Warwick, about a Supply of Money for him. The King's Letter to the principal Officers of the Navy, not to obey the Directions of both Houses. The Earl of Holland's Letter, about the Delivery of the Petition to the King. Merchant Strangers to lend Money to the Parliament. Order against executing the Commissions of Array. Order for 200l. to L. Dowcray. Order for 200l. for the Archbishop of Cashell. Order for 200l. for Richard Fitzgerald. Order for 50l. for Roger Hodges. Order for 200l. for Dr. Jones. Order for 200l. for Lady Eliz. Gray. Order about the Propositions for raising Horse. &c. in Dorsetshire. 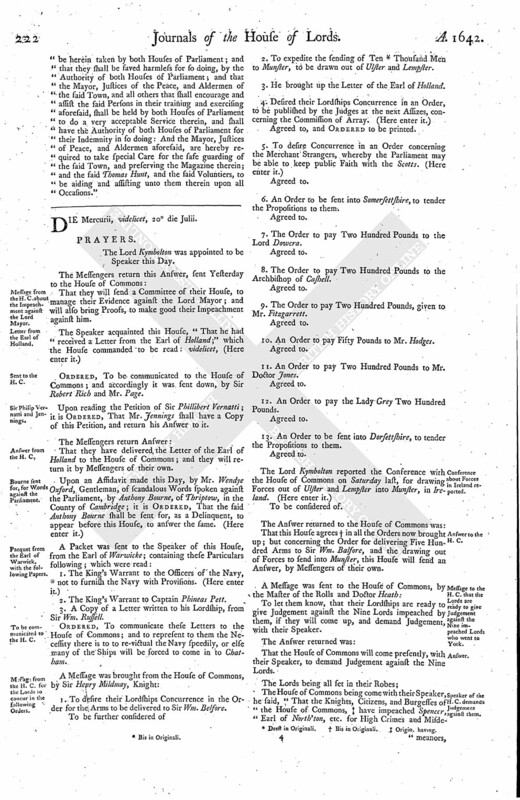 Order about the Propositions for raising Horse &c. in Somersetshire. Bourne's Words against the Parliament. Directions for subduing Munster and Limerick. That they will send a Committee of their House, to manage their Evidence against the Lord Mayor; and will also bring Proofs, to make good their Impeachment against him. Ordered, To be communicated to the House of Commons; and accordingly it was sent down, by Sir Robert Rich and Mr. Page. Upon reading the Petition of Sir Phillibert Vernatti; it is Ordered, That Mr. Jennings shall have a Copy of this Petition, and return his Answer to it. That they have delivered the Letter of the Earl of Holland to the House of Commons; and they will return it by Messengers of their own. 2. The King's Warrant to Captain Phineas Pett. 3. A Copy of a Letter written to his Lordship, from Sir Wm. Russell. Ordered, To communicate these Letters to the House of Commons; and to represent to them the Necessity there is to to re-victual the Navy speedily, or else many of the Ships will be forced to come in to Chatham. 1. To desire their Lordships Concurrence in the Order for the Arms to be delivered to Sir Wm. Belfore. 2. To expedite the sending of Ten (fn. 2) Thousand Men to Munster, to be drawn out of Ulster and Lempster. 3. He brought up the Letter of the Earl of Holland. Agreed to, and Ordered to be printed. 6. An Order to be sent into Somersettshire, to tender the Propositions to them. 7. The Order to pay Two Hundred Pounds to the Lord Dowera. 8. The Order to pay Two Hundred Pounds to the Archbishop of Cashell. 9. The Order to pay Two Hundred Pounds, given to Mr. Fitzgarrett. 10. An Order to pay Fifty Pounds to Mr. Hodges. 11. An Order to pay Two Hundred Pounds to Mr. Doctor Jones. 12. An Order to pay the Lady Grey Two Hundred Pounds. 13. An Order to be sent into Dorsettshire, to tender the Propositions to them. That this House agrees (fn. 3) in all the Orders now brought up; but concerning the Order for delivering Five Hundred Arms to Sir Wm. Balfore, and the drawing out of Forces to send into Munster, this House will send an Answer, by Messengers of their own. To let them know, that their Lordships are ready to give Judgement against the Nine Lords impeached by them, if they will come up, and demand Judgement, with their Speaker. That the House of Commons will come presently, with their Speaker, to demand Judgement against the Nine Lords. The House of Commons being come with their Speaker, he said, "That the Knights, Citizens, and Burgesses of the House of Commons, (fn. 4) have impeached Spencer, Earl of North'ton, etc. for High Crimes and Misde meanors, to the Interruption of the Proceedings in Parliament and great Affairs of the Kingdom, and tending to the Dissolution of the Parliament, and Disturbance of the Peace of the Kingdom; for which the House of Commons have commanded him to demand their Lordships Judgement." "1. That Spencer Earl of North'ton, Wm. Earl of Devon, Henry Earl of Dover, Henry Earl of Monmouth, Charles Lord Howard of Charleton, Robert Lord Rich, Charles Lord Grey of Ruthen, Tho. Lord Coventry, Arthur Lord Capell, shall not sit or vote in the Lords House, during this present Parliament. 2. That they shall not enjoy the Privilege of Parliament, as Members of Parliament. "3. That they shall stand committed to The Tower, during the Pleasure of this House." After this, the House of Commons departed, with their Speaker, to their own House. Ordered, That the Committee for the Defence of the Kingdom shall prepare a Draught of a Letter to be sent to the Earl of Holland, and the Committee which carried the Petition to the King, That, if they received not a speedy Answer from the King, that they shall return by Friday; which Letter is to be presented to the House. To desire their Concurrence in an Order made on Saturday last, for the disposing of the Arms which came from Hull. Whereas We have, for divers important Reasons much concerning Our Service, discharged Our Right Trusty and Right Well-beloved Cousin and Counsellor the Earl of Northumberland from the Office of Lord Admiral of England, and intend to put that Place into a Commission; and whereas We have appointed and authorized Our Servant Sir John Pennington to be Admiral in the Ship The James, of Our present Fleet at Sea: Our Will and Command therefore is, That you cause to be sent to the said Sir John Pennington (as soon as he shall send to you) Our Standard, and such other Necessaries and Provisions, for the Use of Our Ships and Fleet committed to his Charge, as he shall from Time to Time send to you for, until We shall have settled Our Commission for the Admiralty; for which this shall be your sufficient Warrant. Given at Our Court at Yorke, the 28th Day of June, 1642. "To Our Trusty and Well-beloved Captain Phineas Pett, now at Chatham, or to any of the Officers of Our Navy there." London, Navy Office, this 15th of July, 1642. "Your Lordship's most humble Servant, William Russel." Trusty and Well-beloved, We greet you well. Whereas We have discharged the Earl of Northumberland from the Office of Lord High Admiral of England, so as at the present We have no Admiral; and whereas We have likewise commanded the Earl of Warwick, upon his Allegiance, to deliver the Possession of Our Ship The James, and the rest of Our Fleet, to Sir John Pennington, to whom We have given Warrant to take the Charge and Command of Our Fleet; and whereas the said Earl of Warwick, notwithstanding Our said Command, doth rebelliously withhold from Us our said Ship and Fleet: We do therefore, by these Our Letters, will and command you, upon your Allegiance, not to obey any Order, Ordinance, or Warrant whatsoever, which shall be sent unto you, or any of you, from one or both Our Houses of Parliament, or from the said Earl of Warwick, or any other, for any Stores or Provisions, or for any Business whatsoever concerning Our said Fleet, Navy, or Ships; and that you take special Care, that no Monies or Provisions of any Kind whatsoever be issued or expended by you, or any of you, or any Officer subordinate to you, for the Use of any of the Ships belonging to Our Fleet now at Sea, without Warrant from Us, or such as We shall appoint Commissioners for Our Admiralty and Navy; and herein We require your exact Obedience, as you tender the Forfeiture of your Places, and will answer the contrary; for which this shall be your Warrant. Given at Our Court at Yorke, the 7th Day of July, 1642. "To Our Trusty and Wellbeloved the principal Officers of Our Navy, or to any of them." Beverley, this 18th of July, 1642. Your Lordship's most humble Servant, Holland. "To the Right Honourable the Speaker of the House of Peers." 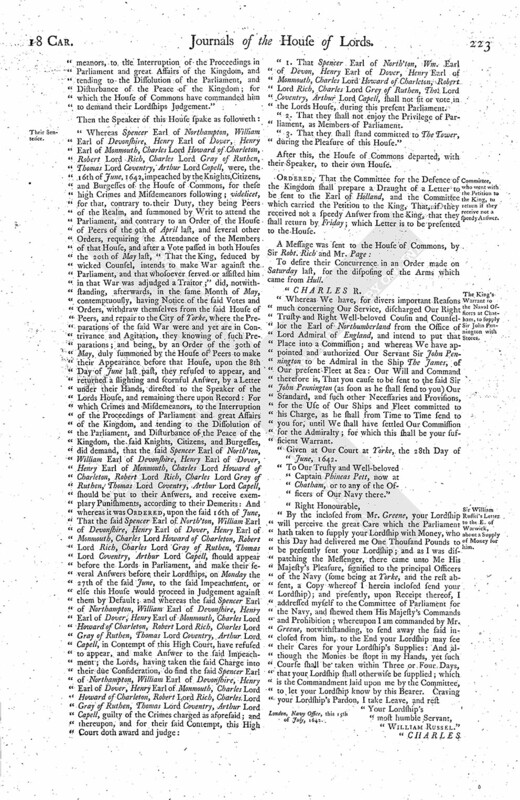 "It is this Day Ordered, by the Lords and Commons in Parliament assembled, That every Alderman of the City of London, and their Deputy where no Alderman is, be hereby required forthwith to send out his Warrant unto the Common Council Men of his Ward, requiring them with all Speed, in some convenient Place within his Ward, to call before them all and every the Merchant Strangers, together with other Inhabitants that are not free of the said City, dwelling within their foresaid Ward, to know what Sums of Money they have underwritten or promised, or shall by their good Persuasions underwrite or promise, to lend towards the Sum of Fifty Thousand Pounds, desired by both Houses of Parliament to be borrowed of them, to supply many great and urgent Occasions the Parliament at present hath for Money; and forthwith to make Payment of the same into the Chamberlain's Office, in The Guildhall, London; and to return the Names of the several Persons, together with their particular Sums they have or shall lend, unto some one of the Citizens that serve in Parliament for the City of London; and the Officers appointed to receive the Hundred Thousand Pounds lent by the several Companies of London are hereby likewise authorized to receive the several Sums lent by any particular Person that is a Merchant Stranger, or other Inhabitant that is no Freeman of the City, and to give Acquittances for the same." Die Mercurii, 20 Julii, 1642. 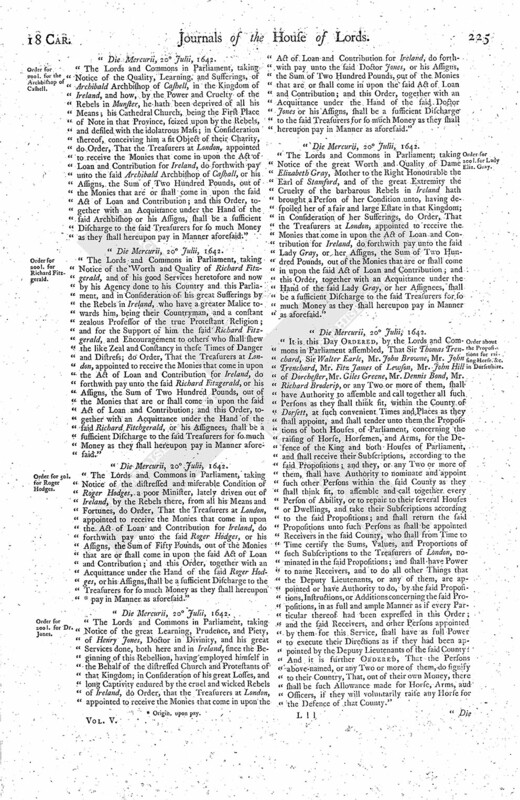 "Whereas several Commissions of Array have lately issued out, under the Great Seal of England, into the several Counties of Leicester, Worcester, and other Counties of this Realm, tending to the great Danger of His Majesty, and the Disturbance of the Peace of this Kingdom: For the preventing thereof, and of the Execution and issuing out of any such Commissions for the Time to come; it is Ordered, by the Lords and Commons assembled in Parliament, That the Judges and Justices of Assize of the several Counties of England and Wales be required, in their several Circuits, at the Assizes and Great Sessions to be next held for each County within this Realm and the Dominion of Wales respectively, in open Court, and in their several Charges to be delivered to the Grand Juries at the said Assizes and Great Sessions, openly to declare and publish, That the said Lords and Commons assembled in Parliament have, upon mature Deliberation, Resolved, upon the Question, That the said Commissions of Array are against Law, and against the Liberty and Property of the Subject; and that all those that are Actors in putting the same in Execution shall be esteemed Disturbers of the Peace of the Kingdom, and Betrayers of the Liberty of the Subject." 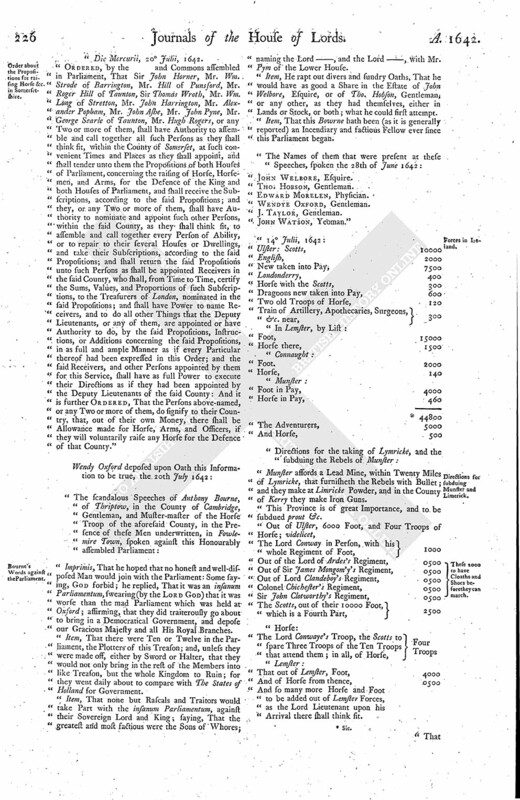 "The Lords and Commons in Parliament, taking Notice of the Worth and Quality of the Lord Theodore Docwra, and how much he hath suffered by the Cruelty of the Rebels in Ireland, being by them dispoiled of a very fair Fortune, and of all the Means of Livelihood he hath; in Consideration thereof, and in Memory of the Worth of Henry Lord Docwra his Father, deceased, and of the great Services by him done to the Crown of England, do Order, That the Treasurers at London, appointed to receive the Monies that come in upon the Act of Loan and Contribution for Ireland, do forthwith pay unto the said Lord Theodore Docwra, or his Assigns, the Sum of Two Hundred Pounds, out of the Monies that are or shall come in upon the said Act of Loan and Contribution; and this Order, together with an Acquittance under the Hand of the said Lord Theodore Docwra, or his Assigns, shall be a sufficient Discharge to the said Treasurers for so much Money as they shall hereupon pay in Manner as aforesaid." The Lords and Commons in Parliament, taking Notice of the Quality, Learning, and Sufferings, of Archibald Archbishop of Cashell, in the Kingdom of Ireland, and how, by the Power and Cruelty of the Rebels in Munster, he hath been deprived of all his Means; his Cathedral Church, being the First Place of Note in that Province, seized upon by the Rebels, and defiled with the idolatrous Mass; in Consideration thereof, conceiving him a fit Object of their Charity, do Order, That the Treasurers at London, appointed to receive the Monies that come in upon the Act of Loan and Contribution for Ireland, do forthwith pay unto the said Archibald Archbishop of Cashall, or his Assigns, the Sum of Two Hundred Pounds, out of the Monies that are or shall come in upon the said Act of Loan and Contribution; and this Order, together with an Acquittance under the Hand of the said Archbishop or his Assigns, shall be a sufficient Discharge to the said Treasurers for so much Money as they shall hereupon pay in Manner aforesaid." The Lords and Commons in Parliament, taking Notice of the Worth and Quality of Richard Fitzgerald, and of his good Services heretofore and now by his Agency done to his Country and this Parliament, and in Consideration of his great Sufferings by the Rebels in Ireland, who have a greater Malice towards him, being their Countryman, and a constant zealous Professor of the true Protestant Religion; and for the Support of him the said Richard Fitzgerald, and Encouragement to others who shall shew the like Zeal and Constancy in these Times of Danger and Distress; do Order, That the Treasurers at London, appointed to receive the Monies that come in upon the Act of Loan and Contribution for Ireland, do forthwith pay unto the said Richard Fitzgerald, or his Assigns, the Sum of Two Hundred Pounds, out of the Monies that are or shall come in upon the said Act of Loan and Contribution; and this Order, together with an Acquittance under the Hand of the said Richard Fitchgerald, or his Assignees, shall be a sufficient Discharge to the said Treasurers for so much Money as they shall hereupon pay in Manner aforesaid." The Lords and Commons in Parliament, taking Notice of the distressed and miserable Condition of Roger Hodges, a poor Minister, lately driven out of Ireland, by the Rebels there, from all his Means and Fortunes, do Order, That the Treasurers at London, appointed to receive the Monies that come in upon the Act of Loan and Contribution for Ireland, do forthwith pay unto the said Roger Hodges, or his Assigns, the Sum of Fifty Pounds, out of the Monies that are or shall come in upon the said Act of Loan and Contribution; and this Order, together with an Acquittance under the Hand of the said Roger Hodges, or his Assigns, shall be a sufficient Discharge to the Tresurers for so much Money as they shall hereupon (fn. 5) pay in Manner as aforesaid." 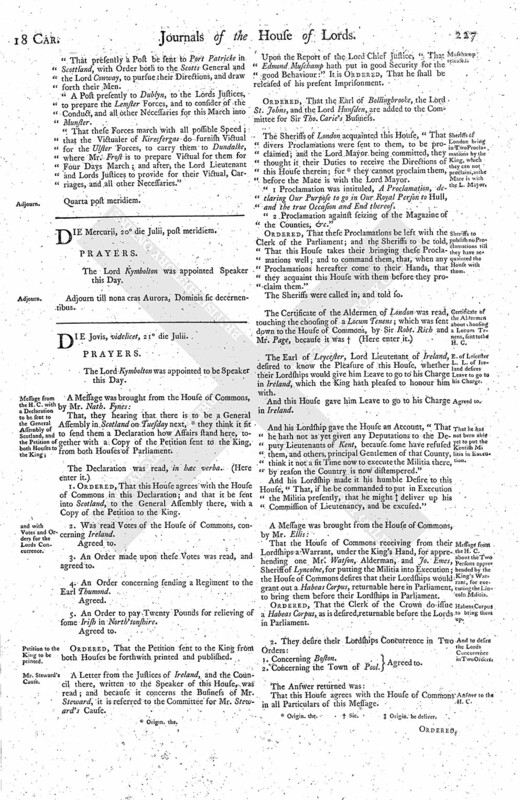 The Lords and Commons in Parliament, taking Notice of the great Learning, Prudence, and Piety, of Henry Jones, Doctor in Divinity, and his great Services done, both here and in Ireland, since the Beginning of this Rebellion, having employed himself in the Behalf of the distressed Church and Protestants of that Kingdom; in Consideration of his great Losses, and long Captivity endured by the cruel and wicked Rebels of Ireland, do Order, that the Treasurers at London, appointed to receive the Monies that come in upon the Act of Loan and Contribution for Ireland, do forthwith pay unto the said Doctor Jones, or his Assigns, the Sum of Two Hundred Pounds, out of the Monies that are or shall come in upon the said Act of Loan and Contribution; and this Order, together with an Acquittance under the Hand of the said Doctor Jones or his Assigns, shall be a sufficient Discharge to the said Treasurers for so much Money as they shall hereupon pay in Manner as aforesaid." The Lords and Commons in Parliament, taking Notice of the great Worth and Quality of Dame Elizabeth Gray, Mother to the Right Honourable the Earl of Stamford, and of the great Extremity the Cruelty of the barbarous Rebels in Ireland hath brought a Person of her Condition unto, having despoiled her of a fair and large Estate in that Kingdom; in Consideration of her Sufferings, do Order, That the Treasurers at London, appointed to receive the Monies that come in upon the Act of Loan and Contribution for Ireland, do forthwith pay unto the said Lady Gray, or her Assigns, the Sum of Two Hundred Pounds, out of the Monies that are or shall come in upon the said Act of Loan and Contribution; and this Order, together with an Acquittance under the Hand of the said Lady Gray, or her Assignees, shall be a sufficient Discharge to the said Treasurers for so much Money as they shall hereupon pay in Manner as aforesaid." It is this Day Ordered, by the Lords and Commons in Parliament assembled, That Sir Thomas Trenchard, Sir Walter Earle, Mr. John Browne, Mr. John Trenchard, Mr. Fitz James of Lewson, Mr. John Hill of Dorchester, Mr. Giles Greene, Mr. Dennis Bond, Mr. Richard Broderip, or any Two or more of them, shall have Authority to assemble and call together all such Persons as they shall think fit, within the Country of Dorsett, at such convenient Times and Places as they shall appoint, and shall tender unto them the Propositions of both Houses of Parliament, concerning the raising of Horse, Horsemen, and Arms, for the Defence of the King and both Houses of Parliament, and shall receive their Subscriptions, according to the said Propositions; and they, or any Two or more of them, shall have Authority to nominate and appoint such other Persons within the said County as they shall think fit, to assemble and call together every Person of Ability, or to repair to their several Houses or Dwellings, and take their Subscriptions according to the said Propositions; and shall return the said Propositions unto such Persons as shall be appointed Receivers in the said County, who shall from Time to Time certify the Sums, Values, and Proportions of such Subscriptions to the Treasurers of London, nominated in the said Propositions; and shall have Power to name Receivers, and to do all other Things that the Deputy Lieutenants, or any of them, are appointed or have Authority to do, by the said Propositions, Instructions, or Additions concerning the said Propositions, in as full and ample Manner as if every Particular thereof had been expressed in this Order; and the said Receivers, and other Persons appointed by them for this Service, shall have as full Power to execute their Directions as if they had been appointed by the Deputy Lieutenants of the said County: And it is further Ordered, That the Persons above-named, or any Two or more of them, do signify to their Country, That, out of their own Money, there shall be such Allowance made for Horse, Arms, aud Officers, if they will voluntarily raise any Horse for the Defence of that County." Ordered, by the and Commons assembled in Parliament, That Sir John Horner, Mr. Wm. Strode of Barrington, Mr. Hill of Punsford, Mr. Roger Hill of Taunton, Sir Thomas Wroth, Mr. Wm. Long of Stretton, Mr. John Harrington, Mr. Alexander Popham, Mr. John Ashe, Mr. John Pyne, Mr. George Searle of Taunton, Mr. Hugh Rogers, or any Two or more of them, shall have Authority to assemble and call together all such Persons as they shall think fit, within the County of Somerset, at such convenient Times and Places as they shall appoint, and shall tender unto them the Propositions of both Houses of Parliament, concerning the raising of Horse, Horsemen, and Arms, for the Defence of the King and both Houses of Parliament, and shall receive the Subscriptions, according to the said Propositions; and they, or any Two or more of them, shall have Authority to nominate and appoint such other Persons, within the said County, as they shall think fit, to assemble and call together every Person of Ability, or to repair to their several Houses or Dwellings, and take their Subscriptions, according to the said Propositions; and shall return the said Propositions unto such Persons as shall be appointed Receivers in the said County, who shall, from Time to Time, certify the Sums, Values, and Proportions of such Subscriptions, to the Treasurers of London, nominated in the said Propositions; and shall have Power to name Receivers, and to do all other Things that the Deputy Lieutenants, or any of them, are appointed or have Authority to do, by the said Propositions, Instructions, or Additions concerning the said Propositions, in as full and ample Manner as if every Particular thereof had been expressed in this Order; and the said Receivers, and other Persons appointed by them for this Service, shall have as full Power to execute their Directions as if they had been appointed by the Deputy Lieutenants of the said County: And it is further Ordered, That the Persons above-named, or any Two or more of them, do signify to their Country, that, out of their own Money, there shall be Allowance made for Horse, Arms, and Officers, if they will voluntarily raise any Horse for the Defence of that County." Imprimis, That he hoped that no honest and well-disposed Man would join with the Parliament: Some saying, God forbid; he replied, That it was an insanum Parliamentum, swearing (by the Lord God) that it was worse than the mad Parliament which was held at Oxford; affirming, that they did traiterously go about to bring in a Democratical Government, and depose our Gracious Majesty and all His Royal Branches. Item, That there were Ten or Twelve in the Parliament, the Plotters of this Treason; and, unless they were made off, either by Sword or Halter, that they would not only bring in the rest of the Members into like Treason, but the whole Kingdom to Ruin; for they went daily about to compare with The States of Holland for Government. Item, That none but Rascals and Traitors would take Part with the insanum Parliamentum, against their Sovereign Lord and King; saying, That the greatest and most factious were the Sons of Whores; naming the Lord —, and the Lord —, with Mr. Pym of the Lower House. Item, He rapt out divers and sundry Oaths, That he would have as good a Share in the Estate of John Welbore, Esquire, or of Tho. Hobson, Gentleman, or any other, as they had themselves, either in Lands or Stock, or both; what he could first attempt. Item, That this Bowrne hath been (as it is generally reported) an Incendiary and factious Fellow ever since this Parliament began. Munster affords a Lead Mine, within Twenty Miles of Lymricke, that furnisheth the Rebels with Bullet; and they make at Limricke Powder, and in the County of Kerry they make Iron Guns. This Province is of great Importance, and to be subdued Prout &c.
Out of the Lord of Ardes's Regiment, 0500 These 2000 to have Cloaths and Shoes beforethey can march. That presently a Post be sent to Port Patricke in Scottland, with Order both to the Scotts General and the Lord Conway, to pursue their Directions, and draw forth their Men. A Post presently to Dublyn, to the Lords Justices, to prepare the Lemster Forces, and to consider of the Conduct, and all other Necessaries for this March into Munster. "That these Forces march with all possible Speed; that the Victualer of Kirecfergas do furnish Victual for the Ulster Forces, to carry them to Dundalke, where Mr. Frost is to prepare Victual for them for Four Days March; and after, the Lord Lieutenant and Lords Justices to provide for their Victual, Carriages, and all other Necessaries." Adjourn till nona cras Aurora, Dominis sic decernentibus.